Kizuna announces its second annual “The Hunt” event, taking place on Saturday, Nov. 9, from 2 to 5 p.m. at Centenary United Methodist Church, 300 S. Central Ave. (at Third Street), Los Angeles. The event will feature a multitude of challenges, clues, and games as teams of young adults and families explore Little Tokyo. New to this year will be two divisions, a competitive division consisting of young adult teams of four to five people, and a family division for participants of all ages in teams of five to ten. This scavenger hunt event will send participants on a unique journey through the Little Tokyo community while involving numerous local businesses and celebrating its important history. Teams will receive clues and challenges, involving visits to businesses and landmarks, as well as with references to historical figures or events in Little Tokyo’s history. The hunt will also feature a festive closing party with food, drink, music, and community vendors for participants to meet other teams and celebrate the completion of the event. 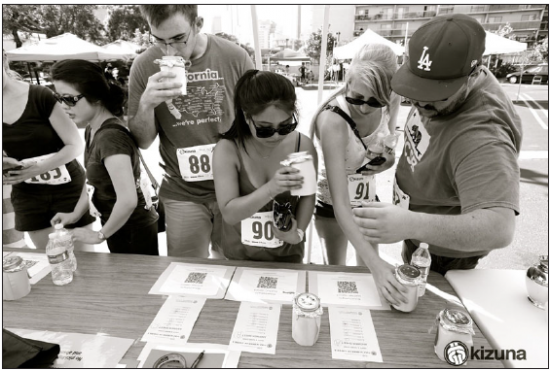 “There are a lot of scavenger hunts happening through Little Tokyo, but what I think makes ours really unique is two-fold: first, we’re utilizing an “Amazing Race”-like format with challenges and mini-events throughout the night, and second, everything in our event from the food, drink and atmosphere is specifically geared toward young adults. It’s going to be quite the event,” said Grant Kai, chair of Kizuna’s “The Hunt” committee. Registration is now available on the website. General admission is $100. There will be $500 grand prize to the winning team of the competitive division. Sponsorships and advertisement opportunities are also available. Ads purchased for teams will also provide each team with a “shortcut,” allowing them a series of advantages during certain challenges throughout the event. Proceeds will go to support Kizuna’s various leadership development programs throughout the year with the intent to create a passion for community service, development of leadership skills, and a path for community involvement for Japanese American youth. Through these programs, Kizuna is building a future generation of leaders who will make an impact in the community.